This trip to AndroidTO 2015 is going to be just has fun has the last tow years I've been going. As always, it always starts with traveling. I opt for the train, as this gives me time to relax, enjoy some scenery and at the same time chat with some of the other business travelers. I could opt to take a flight and be in Toronto in a mere 45 minutes, but the 4 hours train ride is well worth it. On this trip, I took some gear with me for the conference and for my leisure time as well. Not as much as one would think. I've packed 1 single backpack. I've got clothes for a few days an all my gear contained in it. You'd be surprised what I can fit in this bag. For the ones that would be interested to know, I'm using one of my favourites; TYLT's Energi+Backpack. It retails at $169,99, but it's currently on special for $85. All the prices I have are US, so please take the time to convert them to Canadian unless other wise mentioned. There's plenty of other options out there when it comes to backpack for traveling, but this accommodates my mobile lifestyle. Which, if your interested, you can check on in our past articles. I'm housing a Sony Xperia Z2 Tablet as well as my keyboard folios from Logitech. The funny thing, I'm using the TYPE-S folio case that Logitech produced for the Samsung Galaxy Tab S. It works well for what I need it. Furthermore, I also carry a few battery packs, notably the Energi 6K from TYLT as well. You'd think at this point I'm sponsored by TYLT, but I'm not. I just like their products and they seem to like the quality reviews I put out when it comes to consumer usage. This baby will get me through the day at the conference. This should provide me with all the power I need to last the entire day. Not that I use my phone like a mad man, we'll maybe. I maybe qualified a power user. 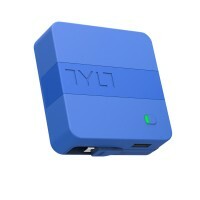 The TYLT Energi 6K can deliver power to any device using it's built-in microUSB cable or you can connect your own cable to power any number of devices. You may need to shell out some money, since it's not cheap. Running at $69,99 this device might turn some people away, but its a good investment. Let's not forget our trusty pal, our love, the things we play with most! Our smartphone, yes, perfect for the conference as you can take notes, snap pictures and keep on trucking while the speakers are going at it! In my case, I'm still a Sony Xperia Z2 daily driver running stock Sony firmware.